I hesitate to admit this, but until this week I had never actually foraged in Brooklyn. (There. I've said it. Now waiting for derisive laughter to subside.) Sometimes we Manhattanites don't think to venture forth into the other boroughs, but the more friends I make in Brooklyn, the more I want to explore. I kind of want to live there. 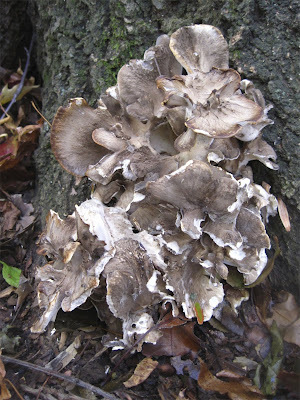 So after listening to Leda rave about her Hen of the Woods harvest and Marie enthuse about her mother lode of oyster mushrooms (both in Prospect Park), I asked Marie to take me for show and tell. I like to think the trip was mutually beneficial; Marie had never hunted for Hens before and we found two in quick succession, thanks to directions (via text message) from Leda. Next we visited Marie's oyster nursery, which was indeed impressive. Many were drying out, but there were several youngsters that were tender and appealing. And since oyster mushrooms are the gift that keeps on giving, there's reason to hope they'll continue to appear throughout the winter. Back at home the oysters were cleaned and prepped for the weekend's Greek feast. They will be fricaseed with romaine lettuce and avgolemano sauce. It may sound like a weird combo, but it is delicious. The Hens were sauteed in olive oil and frozen for future use. And the bits and pieces that were too tough for eating were turned into several quarts of mushroom broth, which should send the aforementioned fricassee over the top. There are acorns in my toilet tank. Well not really. 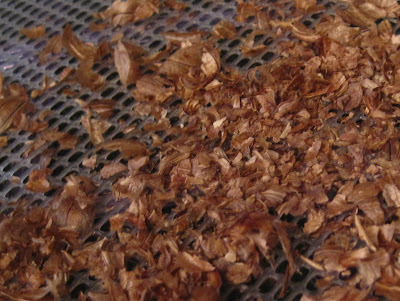 I just took them out, rinsed them well, and now they're in the dehydrator. But I couldn't resist the above as an opening sentence. I like drama. 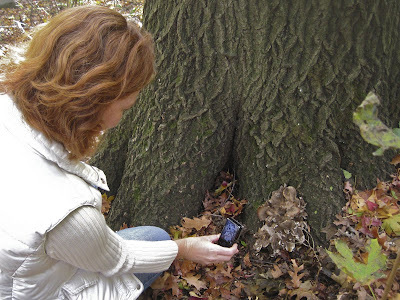 As a forager, I view acorns as a milestone. They are notoriously labor intensive to process but so nutritionally and historically rich (not to mention delicious) that I knew I had to try. In fact, I'm a little embarassed it's taken me so long. 2010 was a mast year in NE PA. That means a year of great acorn abundance. Walk barefoot in my front yard and you're in for some pain. Before we left for Greece, I casually collected about two quarts of large nuts from a neighbor's deck. I hadn't planned it; we were leaving the country in two days and I knew I had no time! But there we were, there the acorns were, and it was so darned simple I couldn't NOT do it. Plus, since these acorns had never touched the ground, I figured there might be less chance of them being maggot infested. I bagged them and put them in the freezer. 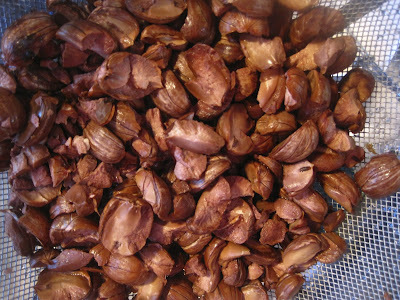 Acorns need to be either dried or frozen if they're not going to be used right away. 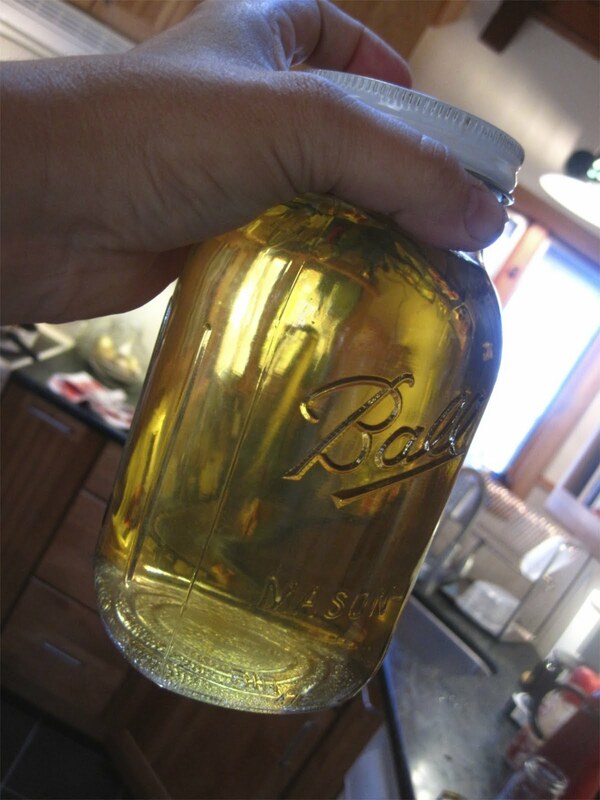 Because they have a high oil content, they turn rancid quickly if held at room temperature without being processed. Since you need several days to prep the nuts, this weekend was my first chance. After shelling the acorns (between layers of towel, with a hammer) I decided to try both. Half the acorns went into a large pot with 3 times (by volume) as much boiling water as acorns. A second pot of water also went on the boil. Apparently the nuts must be transferred from boiling water to boiling water. 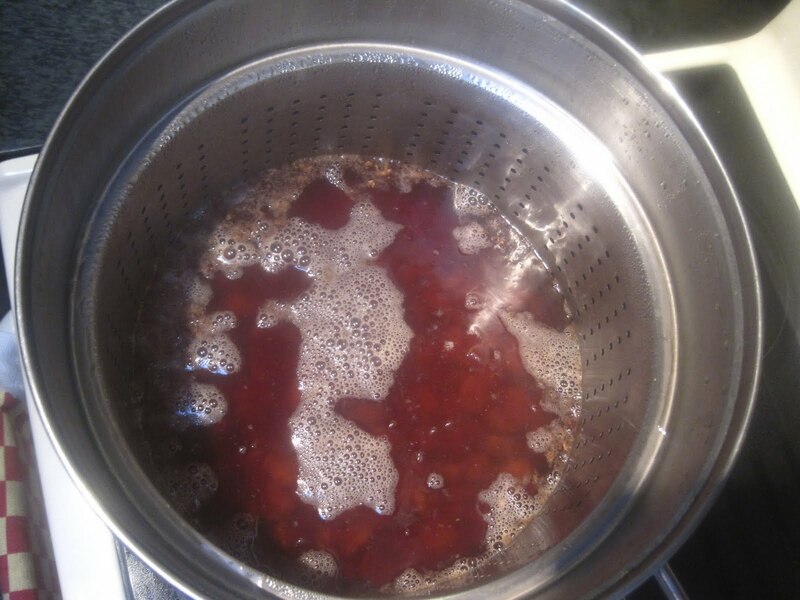 Transferring from boiling to cold (and then re-boiling) may lock in the tannins we're trying to get rid of. 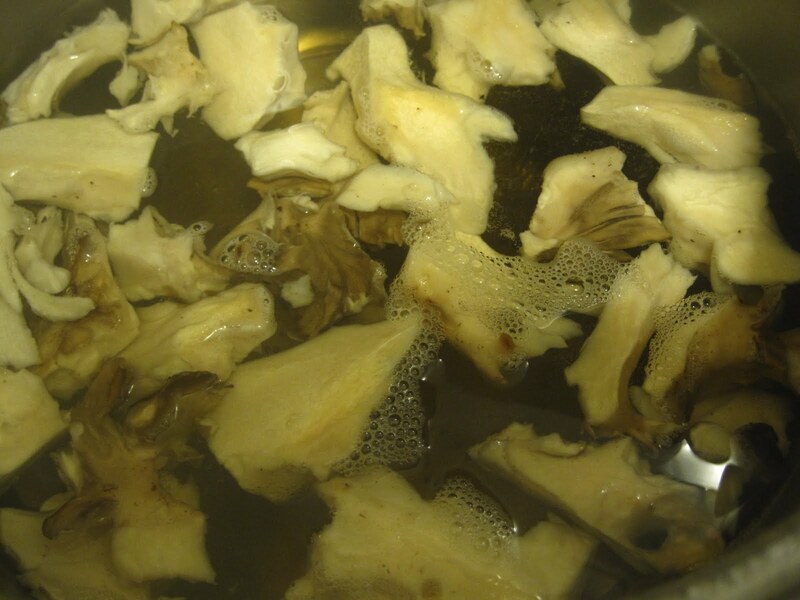 I boiled in six changes of water for 30 minutes each. 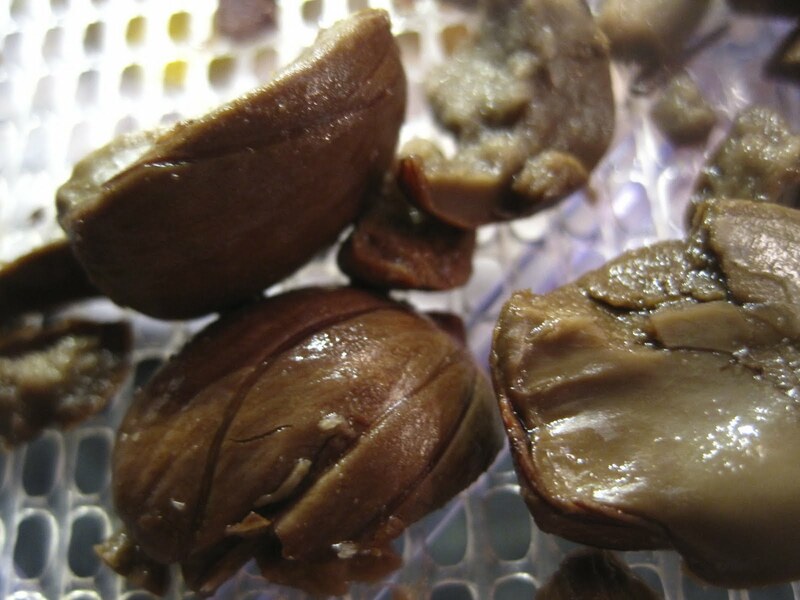 In the end, the water was still light tan, but since the nuts had no trace of a bitter taste, I dubbed them done. Next, they went into the dehydrator for 14-16 hours. Since these were hot leached, I planned to use them in place of nuts in The Joy of Cooking's nut bread recipe. Leda served me this years ago and it made an impression! She also suggested adding 1 tsp of ground spice bush berry, which I did. The bread is delicious with a taste that's impossible to forget. 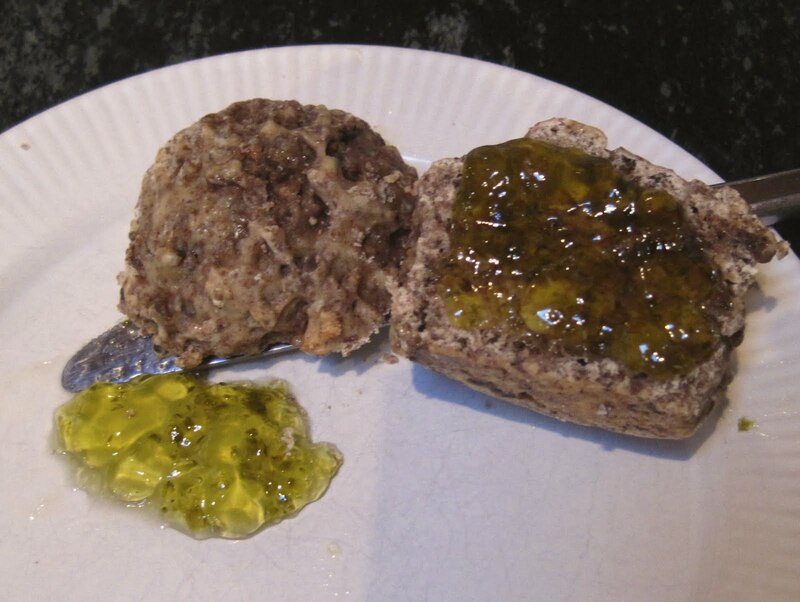 It isn't a sweet bread, but it isn't exactly savory either. 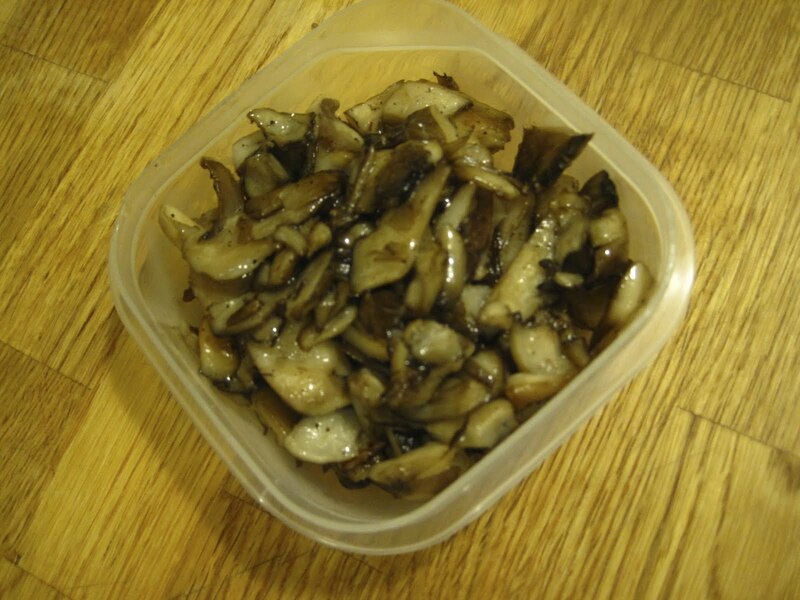 It's dense and dark, the perfect foil for homemade jalapeno jelly. 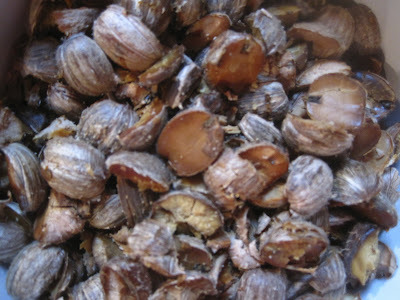 Most people do their cold leaching by grinding shelled acorns in water and creating a slurry which they then pass through layers of cheese cloth. They dry the resulting mush, then grind to a powder. I found the slurry idea a little daunting, but I was intrigued by Deane's description of the toilet tank method. Despite the fact that Sam warns cold leaching is hard to do with un-evenly sized pieces of nut (which is what I'd be doing), I decided to try. Laziness triumphed over caution. emptied and scrubbed the toilet tank, then placed the nuts inside and refilled the tank. Each flush would run fresh water through the acorns, hopefully leaching them enough to get rid of any bitter taste. and after 24 hours I rinsed and tested the nuts. 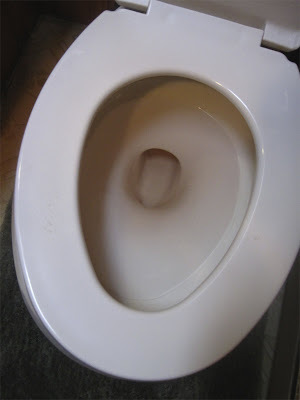 Still a little bitter, so back into the toilet they went. This morning, after 48 hours, the nuts were without a trace of bitterness. They're now in the dehydrator at 125 F, so they should be appropriate for flour. This is the papery nut covering, similar to what you'll find on a peanut. The repeated boils of hot leaching removed most of them and I peeled off the few remaining pieces by hand. Cold leaching left the testa in tact, but they rub off almost inadvertently as you're moving the nuts from the dehydrator to the storage jar. I find mixed opinions on whether removal is necessary, but since they're rumored to hold a lot of tannins and since it's so easy to rub them off, why not? Maybe next time I'll do a taste test and see if it's necessary. Both the hot leached and cold leached nuts will be refrigerated whole after drying; I'll grind as needed. Not sure the cold storage is necessary, but I keep all flour in the fridge and why take chances with such a valuable foraged food? 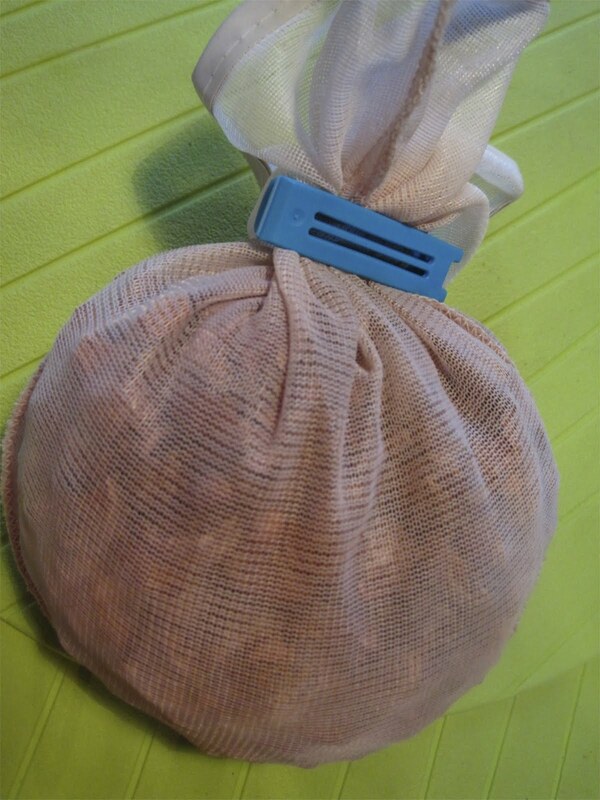 I won't have time to try the acorn flour for a few more weeks, and until then I'll be scouring the interweb for the most worthy of recipes. Suggestions anyone? 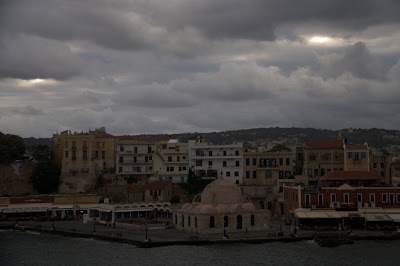 If leaving Milia was sad (and it was), leaving Crete was even sadder. More sad. Both. 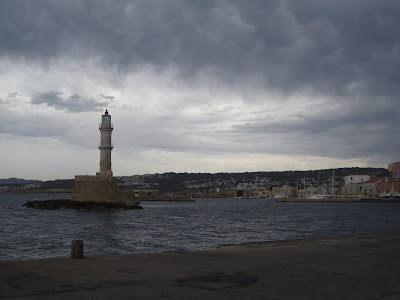 We finally had time to walk the entire arc of the Chania harbor. It looks deceptively small, but the round trip took about an hour, and brought us out to the lighthouse that is a symbol of Chania. Originally constructed by the Venetians, it was in ruins when Egyptian occupiers built a minaret-shaped tower on the Venetian base (1821-1841). 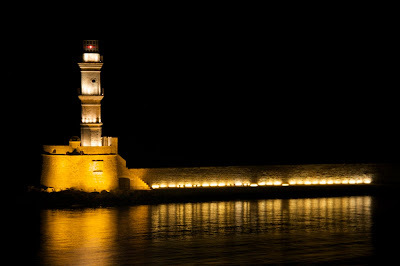 In any light, in any weather, the lighthouse commands your attention. 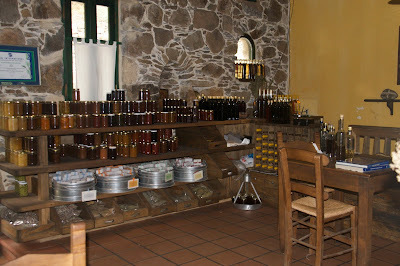 We filled the rest of the day doing errands: shopping, taking pictures, tasting what we hadn't yet tasted. We passed this thing every day in Chania; each time we found it disturbingly grotesque. This sign, on the other hand, amused us greatly. I finally asked the sidewalk guy (every harbor restaurant has a guy on the sidewalk, hustling potential diners) why the sign said what it said. He explained that EVERYbody says they're the best and that his restaurant knew they weren't the best, but that they were plenty good enough. I appreciated his attitude, but it wasn't lunchtime. 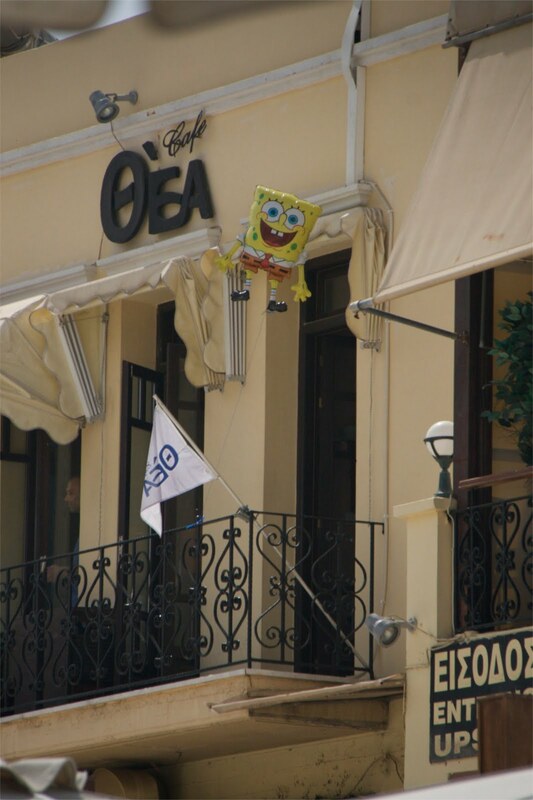 Spongebob is even scarier in Greece. 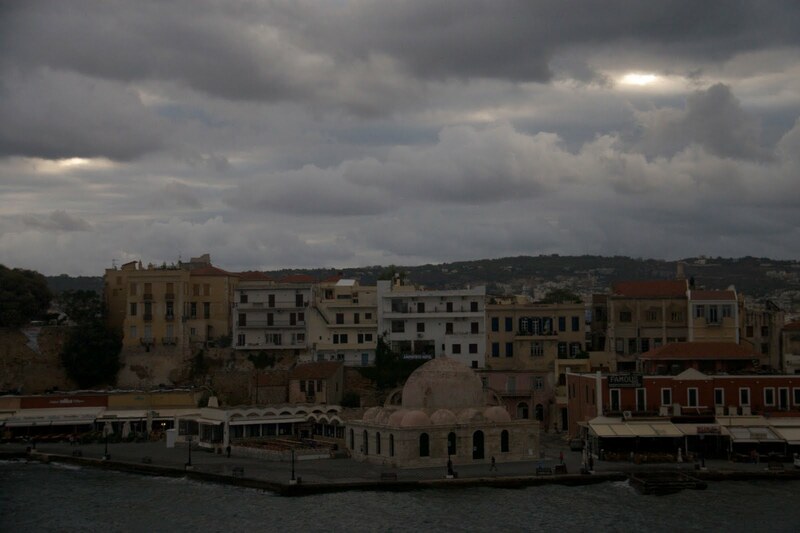 We flew out of Chania that evening. The only vending machine offering food service at our gate was appropriate and emblematic of our entire trip: unexpected, funny, and in very good taste. We spent that night at the Athens airport hotel and flew home the following morning, but essentially our trip ended in Chania. What a time we had. P.S. 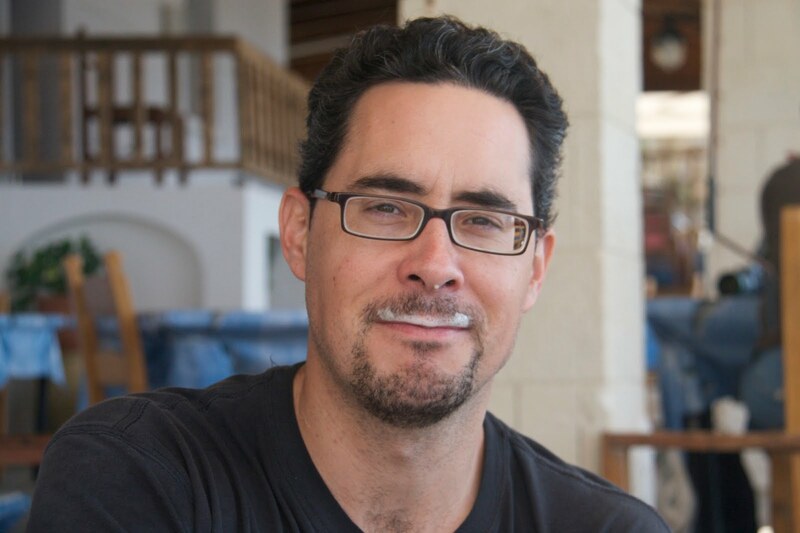 Joe (above) is the undisputed champion of the 2010 Chania Chicken Foot World Cup. Last name withheld to protect the corporate. It was a sad day the day we left Milia. But before the sadness came lunch. Milia is extra-special fertile, much greener than many other parts of Crete. 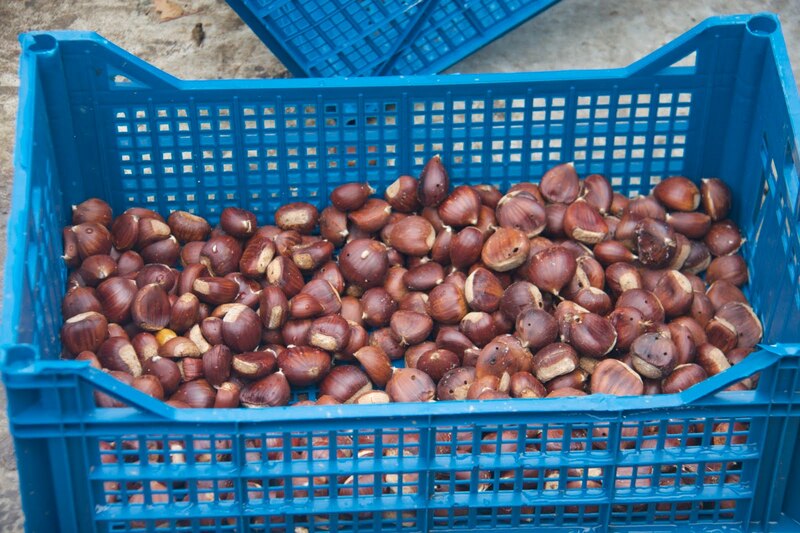 You'll find more than just olive trees here: apples, pears, figs, and best of all: chestnuts! 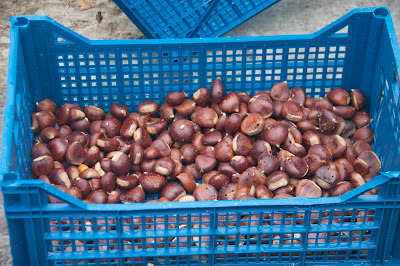 The chestnuts were just ripening in Milia, and on our way to lunch we saw crates of nuts outside the kitchen. Would they be served for lunch? (fingers crossed) When we went inside, the kitchen staff was working hard, shelling and cleaning the nuts. Lunch was delicious (of course). We ate several of the dishes we'd helped make the day before; some things taste even better the second day. 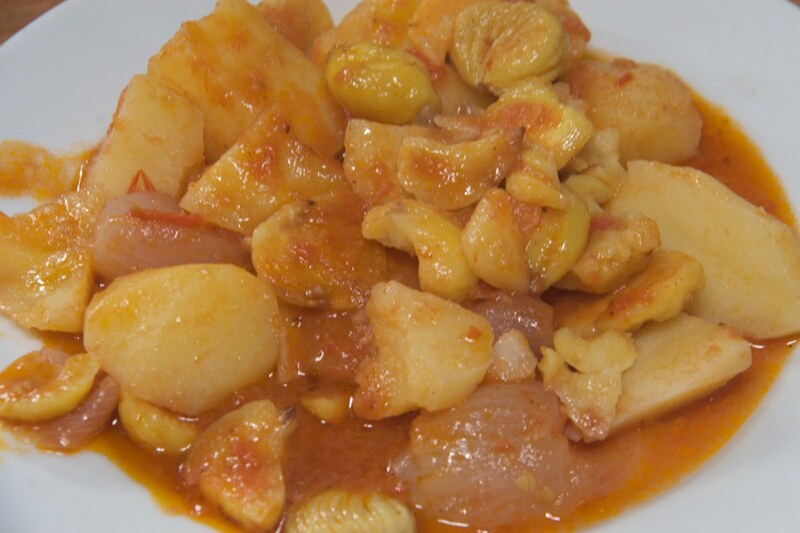 But the star of the meal was a dish of chestnuts, potatoes, onions, and tomatoes. After making some well-considered purchases from the shelves of home made edibles (jams, olive oil, vinegar, wine, rakomelo, olives, herbs, soaps), we shouldered our packs, and headed back to Chania. We'd had such a good lunch at Portes that we went back for dinner: sardines wrapped in grape leaves. 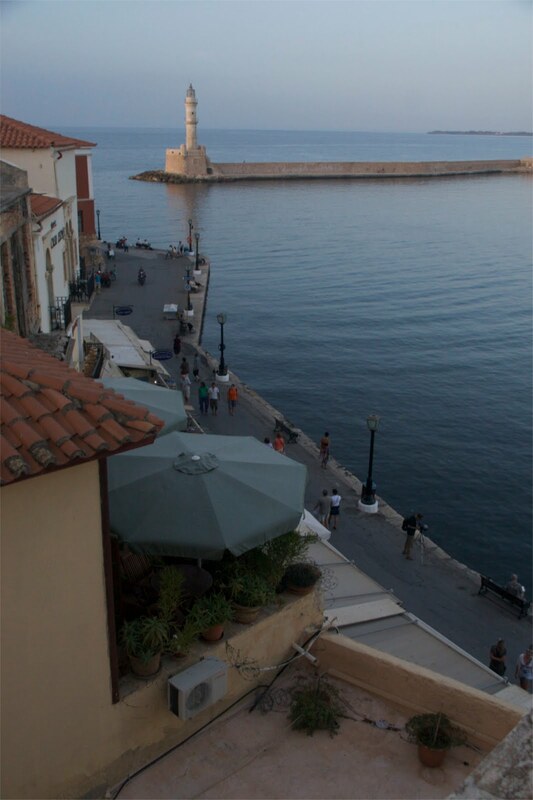 The season was changing in Crete. It had been hot and humid ten days ago, but tonight we were glad for our sweaters and the wind whipped up white caps in the harbor. It started to rain as we walked back to the hotel. This was our last night in Crete and we had a tournament to finish.